Plaque psoriasis is the most common form of psoriasis; about four out of five psoriasis sufferers have this form of the condition. The skin is affected by red spots, which have white or silvery scales on them. These plaques can be found on any part of the body, but the knees, elbows, back and scalp are most commonly affected. In some cases the plaques are itchy, but often they don’t itch at all. 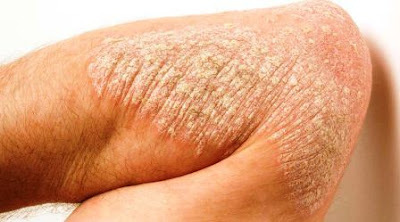 The psychological effects of plaque psoriasis can be worse than the physical effects, particularly in young people who lack confidence. There are a wide variety of treatment options for plaque psoriasis. However, as stress is known to make psoriasis worse, it’s important to try to live as relaxed a life as possible. Most of us can’t avoid stress entirely, but it helps if we can at least put aside some time during the day to relax, possibly using yoga or other relaxation techniques. Some people find physical exercise, such as jogging or swimming, relaxing. Emollients (moisturisers): These are useful when psoriasis is only mild, but won’t cure severe cases. There are a vast range of commercial formulations. Coconut oil is a popular, but somewhat messy, option. Leave it on your skin and scalp for as long as practicable, then wash off. Topical steroids: These drugs are often prescribed for plaque psoriasis. They can be effective at first, but may eventually give side-effects if used for too long. Thinning of the skin can occur, along with stretch marks. Nowadays steroids are usually only prescribed for a limited period of time. There can be a rebound effect when they are stopped, with the plaques returning with a renewed vigour. Betamethasone (trade names Betnovate and Diprosone) is a commonly used steroid. Vitamin D analogues: Calcipotriol, found under the trade names of Dovonex and Daivonex, is a vitamin D analogue often used to treat milder cases of plaque psoriasis. It is more suitable for continuous use then steroids, as it tends to give fewer side-effects. Coal tar products: Coal tar has long been used for centuries to treat plaque psoriasis. Modern formulations are much less messy and smelly than those used in the past. Dithranol: This topical treatment is usually effective against plaque psoriasis. It can stain clothing and bedding, and some people find it gives a burning sensation when used, so it’s not for everybody. Light Treatments (phototherapy): These include the use of UV B light, and also the use of UV A light in conjunction with a psoralen medication (PUVA therapy). Long-term use of these methods is best avoided, since there is an increased risk of skin cancer. Many people find that simple exposure to sunlight helps their psoriasis, provided that exposure is limited to avoid burning. Systemic therapy: If the various topical treatments fail, your doctor may recommend an oral or injectable therapy. These are all powerful medications, which can have significant side-effects. Methotrexate (trade name Maxtrex) is sometimes used, but can cause severe birth defects and also damage sperm. Both men and women taking this drug should take care to always use effective methods of contraception. Newer biological agents, such as Adalimumab, which are taken by injection, can be very effective. However, they are expensive, so don’t expect your doctor to prescribe them until everything else has failed. 0 Response to "Plaque psoriasis treatment"